To say that this time of the year brings my anticipation of flowers to an all time high is an understatement. The breeze in Ellensburg is drenched in the scent of lilacs, and I tend to inhale deeply, drinking in the scent. And on my kitchen table, they are even more lovely! The variety I have in my yard is a mystery, but the plants came to Ellensburg with some of the first settlers. My heart is captivated by this old-time flower. I have poured over books and the internet in hopes of growing them here. 36 out of my 38 roots made it through the winter and are doing fantastic. My flower seeds are slowly making it into the ground. Enough to fill my little farm stand with bouquets all summer long. I am smitten with old fashioned flowers and heirloom varieties. They tend to be easy to grow, tough enough to stand our inclement weather, and I love the fact that my Great Grandma had them in her garden. Sometimes the old varieties get lost in all the new hybrids available today. It's a family affair...the kids love to make bouquets and harvest veggies for the stand, too. Occasionally, we have an extra little helper in the garden. Last year, little bully found a way through the fence each morning into the raspberries and carrots. I am humming with ideas and dreams of which seeds to plant where, how to aesthetically lay out my garden. Such fun this time of the year! Are you an aspiring flower farmer...or maybe just want to grow blooms for your own use? A wonderful blog chock full of planting tutorials. An amazing book on growing cool weather flowers. Another great source for seeds. Julia, Beautiful, Beautiful, Beautiful.. hope you are doing well.. 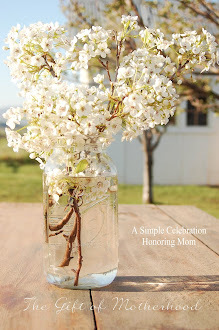 Happy Spring across the miles..
Julia this is such an inspiring post! I am trying to learn how to grow a small cut flower garden for bouquets to share with others; your stand is too cute, i remember reading how it came to be.........do want to ask, where did you get those great boxes you use to showcase the produce and arrangements in? what a perfect touch!!! Beautiful! I love your white, pink, and burgundy arrangements! Such beautiful photos! I don't comment very often, but I find you blog so peaceful, genuine & sincere! The most beautiful post ever!! Sorry it took me so long to come by!! Happy Mother's Day - to you my friend!! Such gorgeous arrangements - I wish we lived closer.